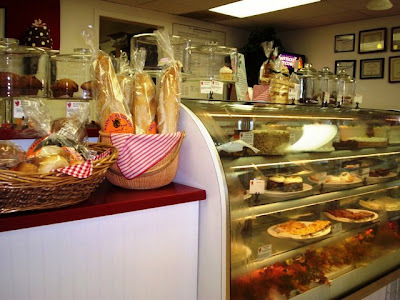 JUNE 2009: A new bakery has taken over. Check out Madrid's review here. During one of her Internet searches, Mom came across a place called the Wayside Country Store. Located in Marlboro, MA, this country store complex has been in operation since 1929 when Henry Ford owned and operated it. Now home to several different shops and businesses, Wayside has definitely become quite the tourist attraction. 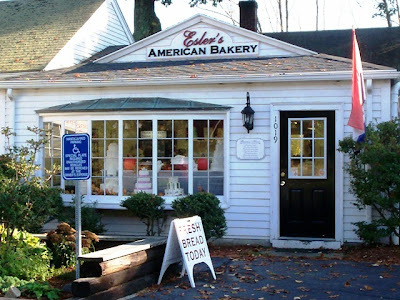 One of the businesses Mom read about was called Esler's American Bakery. 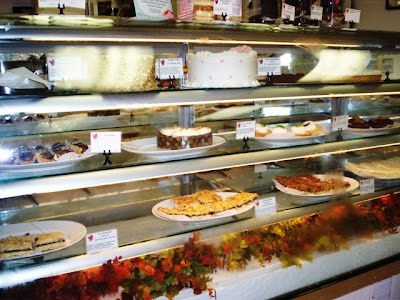 With its homemade cakes and fine desserts, Esler's became the first stop on our visit to Wayside. When we pulled into the parking lot at around 3 p.m., we both thought that the entire complex was beautiful and well-kept. All the buildings are white and seem to be set really close to one another, if not connected. We spotted Esler's right away and were dying to try one of their decadent desserts. After stepping inside, we realized that Esler's was a tiny bakery that seemed to specialize in wedding and occasion cakes. However, they had a wide assortment of baked goods such as muffins, breads, brownies, and other pastries. The interior of Esler's is very fresh and pristine, which makes the yummy desserts stand out against the white wall color. There is a glass display case located under a large window that shows off some of their wedding cake designs. Parallel to the cardboard cakes is where all the action is - Esler's exquisite chilled display case filled with some of the most beautiful desserts we had ever seen. With cakes like the Chocolate Blackout, Boston Cream Pie, Coconut Buttercream, Lemon Layer, Strawberry Shortcake, Traditional Buttercream, and Carrot, any dessert lover will find something to drool over. Esler's also features a cake called The Atomic, which is their take on a Chicago bakery classic. Starting with a layer of chocolate cake, Esler's adds chocolate pudding, banana cake, sliced bananas, vanilla pastry cream, yellow cake, sliced strawberries, and just enough whipped cream to truly make this cake "atomic." Round layer cake prices start at $20 for a 6" (serves 6-8), to $85 for a 16" (serves 40-50). Sheet cake prices start at $45 for a 1/4 sheet (serves 20), to $140 for a full sheet (serves 90). Esler's also specializes in gluten- and dairy-free goodies, including the buttercream cakes, vanilla or chocolate cupcakes by the dozen ($18.50), cookies, and their Pavlova cake, which features three layers of meringue filled whipped cream and fresh fruit - inspired by the New Zealand tradition (6" at $20, 8" at $25, and 10" at $32). Please allow 48-hours notice for Esler's to prepare your specialty order. On the counters and in the pastry case were many different treats, such as the lemon bars ($2), double chip brownies ($2), chocolate pecan bars ($2), streusel bars ($1.75), eclairs ($2.75), cream puffs ($2.75), and chocolate chip, oatmeal raisin, and mudslide cookies ($1.75). Be careful - the mudslide cookies have been rated PG-13 for adult chocolate content. Also at Esler's is a variety of tarts such as the fresh fruit, key lime, apple, chocolate raspberry, banana cream, lemon, and peanut butter. Tarts are either made in 4" or 8/9" sizes, depending on how many people you want to feed. 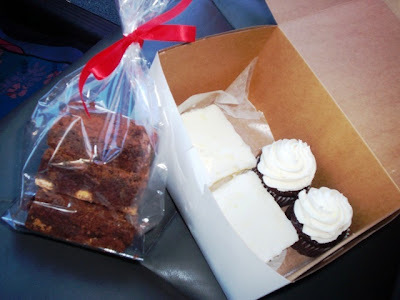 Other goodies include the mini cakes ($4.75), fig bars ($2), and the fresh baked bread from Pain D'Avignon in Hyannis, MA. Mom and I saw loaves of French, Italian, and rye breads available. If you're looking for party platters, Esler's is the place to go. You can choose to have a petite pastry platter ($30-60), or a cookie, brownie, and bar platter ($18-40). If you're just stopping in for a muffin or two, make sure to grab a cup of joe. Esler's proudly serves Terroir coffee from the George Howell Coffee Company in Acton, MA. Of course, we wanted to buy everything in the bakery, but the prices are a bit high here and we still wanted to shop our way around the plaza. However, after looking at all those desserts, we were starving. We headed back to my car to "sample" what we'd purchased. My "sampling" turned into me stuffing my face with both a cupcake and a lemon bar. Mom had a bit more restraint than I did - she did not eat all of her lemon bar. Instead, she saved the second half for later and devoured her chocolate cupcake. The cupcake, besides looking beautiful, tasted delicious. It was very moist with a deep fudgey taste. The frosting on top was surprisingly not sweet. Mom was afraid she was going to get a big dose of sugar when she bit into it, but instead the frosting was delicately sweet. She definitely wants to get a half dozen of them on our next visit. The lemon bar was outstanding. With a shortbread bottom, the lemon filling was neither too sweet nor too tart and topped with a hard, sugar icing that was cool and refreshing. Full of pastry, we got out of the car and decided to work off some calories by visiting the nearby country store. Both Mom and I felt that Esler's was definitely a great find, and we can't wait to go back for more. Esler's American Bakery, at the Wayside Country Store Plaza, is open from 8 a.m. to 4 p.m. Tuesday through Wednesday, from 8 a.m. to 5 p.m. Thursday through Saturday, and 8 a.m. to 2:30 p.m. on Sunday. Esler's is closed on Mondays.